ALL OF THE IMAGES IN THIS GALLERY ARE AVAILABLE FOR SALE AND CAN BE MADE INTO PRINTS, SHOWCASED ON A CANVAS, PRINTED ON HOUSEWARE ITEMS AND/OR WORN ON T-SHIRTS. I HAVE WATERMARKED THE IMAGES FOR SECURITY PURPOSES, BUT THE WATERMARK WILL NOT APPEAR ON ANY PURCHASE. IF YOU WOULD LIKE ANY IMAGE MOUNTED ON A 5X7 GREETING CARD, PLEASE CONTACT ME DIRECTLY AT "TLCHAPMAN@HOTMAIL.COM". IF YOU SEE ANY IMAGE IN ANOTHER GALLERY, AND WOULD LIKE TO PURCHASE IT, JUST LET ME KNOW AND I WILL UPLOAD THE IMAGE INTO THIS GALLERY FOR YOU. 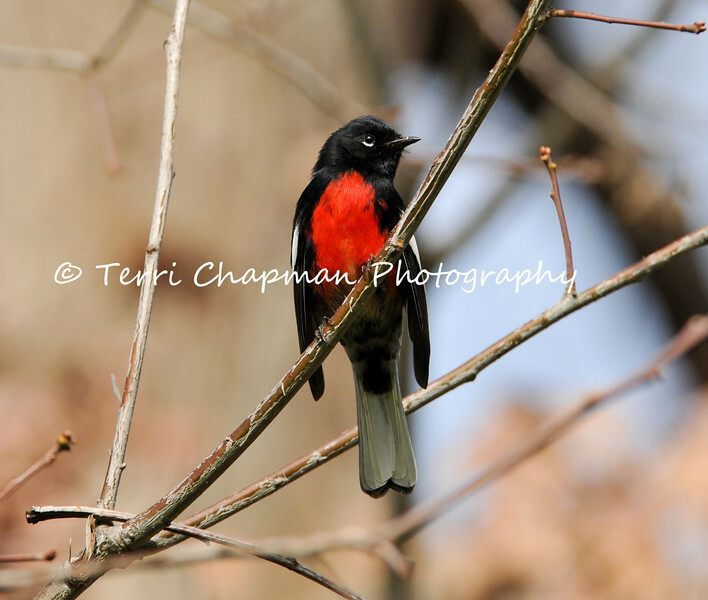 This image is of a male Painted Redstart. The Painted Redstart is a stunning warbler and this particular bird was photographed in San Marino, California, which is not a native location for such a bird, since it is normally found in the borderlands of the American Southwest. Like other "redstarts" in its genus, the Painted Redstart flashes its white wing patches and outer tail feathers when foraging. These action appear to flush insects that the redstart then pursues and captures.